Mary MacKillop was concerned to meet the needs of people whoever they were and wherever they were. Her first school was in rural Penola, her second in the city of Adelaide. Although Aboriginal children were welcome at the schools and other institutes the sisters ran in Australia there was no intentional outreach to the indigenous people. Similarly the sisters in Aotearoa New Zealand taught Māori children but initially the congregation had no formal mission to Māori. This position changed somewhat through Bishop Luck who was concerned that the flourishing Māori Mission of his diocese had collapsed due to pressures from Land Wars and a shortage of priests. He contacted the St Joseph’s Missionary Society (the Mill Hill Fathers) to negotiate priests for the mission promising that a community of nuns would assist the priests. 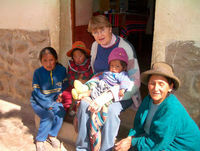 He invited the Sisters of St Joseph to be this community and teach in the re-established missions. Responding to this request three sisters left Sydney in 1890 to serve in Matata, the small Bay of Plenty township where the Mill Hill Fathers would establish their first mission in Aotearoa New Zealand. On her first visit to Aotearoa New Zealand Mary MacKillop spent time with the Matata community enjoying the peace and quiet. In letters back to Australia she wondered how the sisters kept warm and well nourished given the simplicity of the convent and reliance on kumera for food. Practical in nature, Mary arranged for chickens and ducks to be sent to the sisters as well as the netting and wood required to make a poultry yard. Mary also noted that the sisters were well supported and worked well with the Mill Hill Fathers, and that they taught the prayers and Catechism in Māori although the school language was English. The Matata foundation was the beginning of an ongoing collaboration with the Mill Hill Fathers. In the following years sisters accompanied them to found Māori missions in Tokaanu/Waihi and Panguru. The two congregations also served in Rotorua where there was a large Māori community. However, due to the growth of tourism and a significant increase in European settlers in the area it was not considered a Māori Mission. The sisters and fathers worked collaboratively in other parishes as well. Archbishop John Dew and the Sisters of St Joseph invite the people of the diocese of Wellington to collaborate in celebrating Mary of the Cross’s canonisation with Mass in the Cathedral of the Sacred Heart Monday, November 1, at 5.30pm followed by light refreshments in Connolly Hall. Bishop Peter Cullinane and the Sisters of St Joseph invite everyone to the Palmerston North celebrations on Saturday, December 4, at 11am in the Holy Spirit Cathedral.